Click Permalinks in the Settings menu. The Permalink Settings page opens. Default (ugly permalinks): WordPress assigns an ID number to each blog post and creates the URL in this format: http://yourdomain.com/?p=100. Day and Name (pretty permalinks): For each post, WordPress generates a permalink URL that includes the year, month, day, and post slug/title: http://yourdomain.com/2014/02/02/sample-post/. Month and Name (also pretty permalinks): For each post, WordPress generates a permalink URL that includes the year, month, and post slug/title: http://yourdomain.com/2014/02/sample-post/. Numeric (not so pretty): WordPress assigns a numerical value to the permalink. The URL is created in this format: http://yourdomain.com/archives/123. Post Name (preferred): WordPress takes the title of your post or page and generates the permalink URL from those words. For example, the name of the page that contains a bibliography of books can simply be called Books; therefore, with this permalink structure, WordPress creates the permalink URL: http://lisasabin-wilson.com/books. Likewise, a post titled WordPress is Awesome gets a permalink URL like this: http://lisasabin-wilson.com/wordpress-is-awesome. 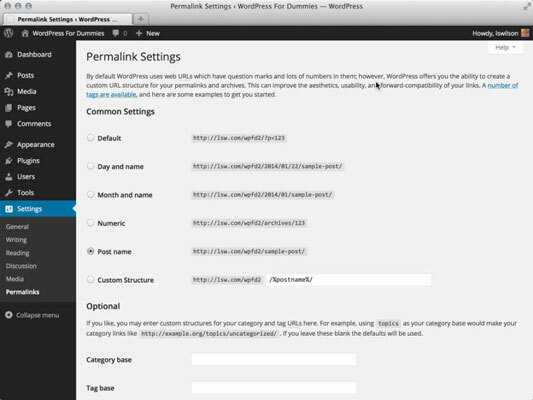 Custom Structure: WordPress creates permalinks in the format you choose. You can create a custom permalink structure by using tags or variables. Your permalink is so pretty!